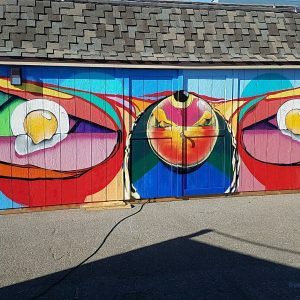 The idea of creating a mural @Fair 44 began with an inspiring conversation between Tayari, of the Dojo Café, and Maxx Moses. A storage shed had just been built on site that was screaming for color. As their conversation elevated the idea of involving select students from the Stephan Hawking Charter school began to crystalize. Maxx returned to school and shared the idea with Mr. Miles the music teacher. The two of them had been collaborating all year with Art and Music and thought it be great to actualize this practice within a real life setting. However, their idea became complete once they decided to involve dance, thus Ms. Cybelle, the Dance teacher completed trio and the Color of Sound was born. 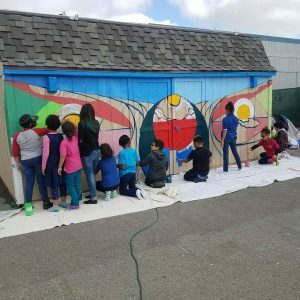 Their goal, create an interactive experience with 3 groups of 13 students who rotated every 45 minutes between mural making, dance and drumming all under the direction of the respective teachers. The outcome was amazing students smiled, laughed and learned throughout the day. Parents participated too. The drumming and dance fed the mural making process and students took on the task of painting with joy and guided professionalism. 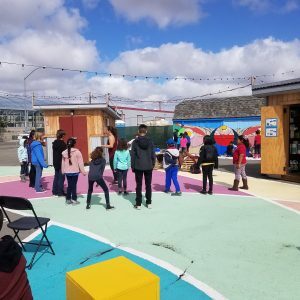 The coolest parts of the day were the spontaneity that burst through when the dance circle formed and the student’s teachers and parents all had a chance to breakdance… what a day. Follow responses to this entry through the feed.